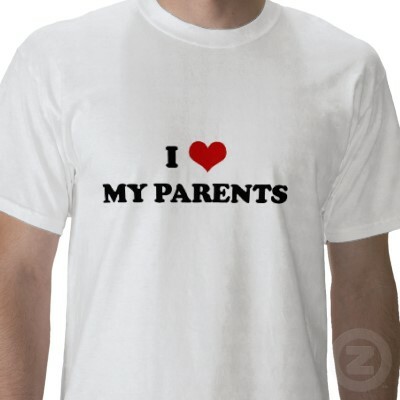 Allah’s Omen, A Childlike’s Amen (Part III) : Enlightenment Via A New Rental House & Parents’ Unconditional Love. As the professional calendar is drawing the finale curtain, the workload in school has become unbearable. Nonetheless, it’s the normal circle of career season one has to bear with. No fuss whatsoever; just merely dictating them. Anyway, as stated earlier; with all the workload and health fiasco sandwiched in between this recent 3 weeks, life has become a little bit topsy-turvy and system has become weary – at least shown through my face and physical as few colleagues and friends said I’ve lost the “cherubic” fats I used to have before I experienced the health fiasco! 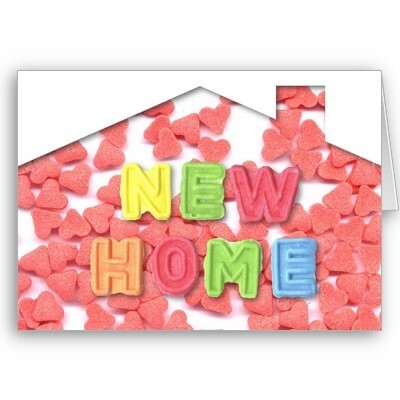 – And to add flavour to it, I’ve managed to scout for a new rent house! My old rent house was actually not a ‘livable’ place for a period more than a month – let alone living almost 2 years there, like I did! When I reported myself to my school, rent house was in my most-wanted-list. At first, I thought I would just lived in school quarters; but I was told on the first day by Headmaster that if I wanted to stay in the school quarter, I would have to wait at least for a month before the fully-occupied-quarters empty – that was that some of the teachers were to move out. In that moment, I couldn’t afford to wait for a whole month! So, with Pak Ngah’s acquaintances, I managed to get a wooden-brick hybrid “Rumah Tradisi” ala Kampung style at Kampung Seri Serendah; which was merely less than 10 minutes journey to school. 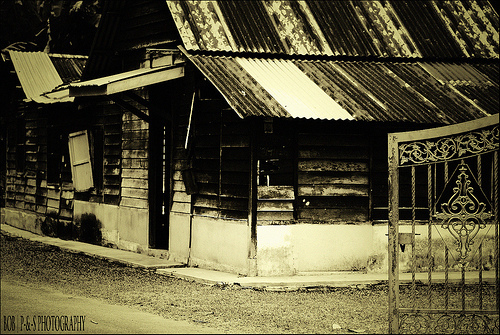 Courtesy by Google Image and the shown website to reflect resemblance of my old rent house. The house was a double storey- with the upper part retaining its wooden architecture whilst the lower part was made into brick-built space- which was initially the wooden pillars. So happened that the previous tenant ran away without paying money leaving things in the house. Thus my parents and Pak Ngah decided to assemble all the previous-tenant’s-belongings on the upper part of the house; sealed the door linking to stair between upper part and lower part and let the front door of the upper part of the house opened; so that the previous-tenant could take all his things back WITHOUT messing up with my belongings in the lower-part of the house. In short, I only lived in the lower part of the house – the upper part? 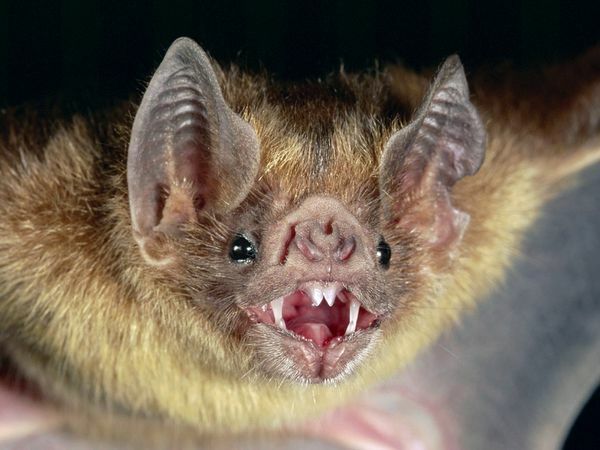 Totally neglected with bats dwelling and infested and bred !!! Furthermore, the wooden part of the house was no more sturdy with windows lopsided and easily askew if one shook the windows! With door and most windows situated NOT at the front part of the house but at both sides of the house facing the neighbours’ houses, it was uncomfortable to open up the door and the windows for air ventilation because you felt as if neighbours could have a peep on what you were doing inside (always go back-and-fro). Hence, I decided to shut the door and windows most of the time, leaving the brick-built-lower-part-space MINIMAL healthy air ventilation! What’s more was that the debris and dusts from bat ruins in the upper part of the house were sometimes transferred down; adding an unhealthy air for me. Apart from that, bees had created colonies amidst the nooks and crannies of the wooden part of the house (which was elongated to the kitchen part) and kept surrounding the lamps! 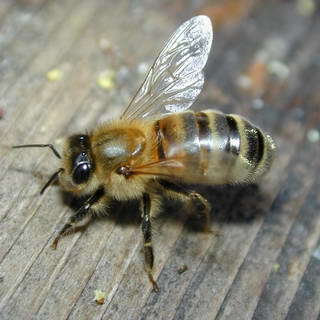 And so happened that I have allergy to bees’ stung (perhaps due to G6PD) – accidental punctures by the bees had been nearly fatal to me throughout the year! Nevertheless, I was nonchalant about the whole minor things because generally, the place was nice and cosy. It maybe small and a bit eerie for friends who came to visit but I felt I can bear and lived with all of those disadvantages…. until……. 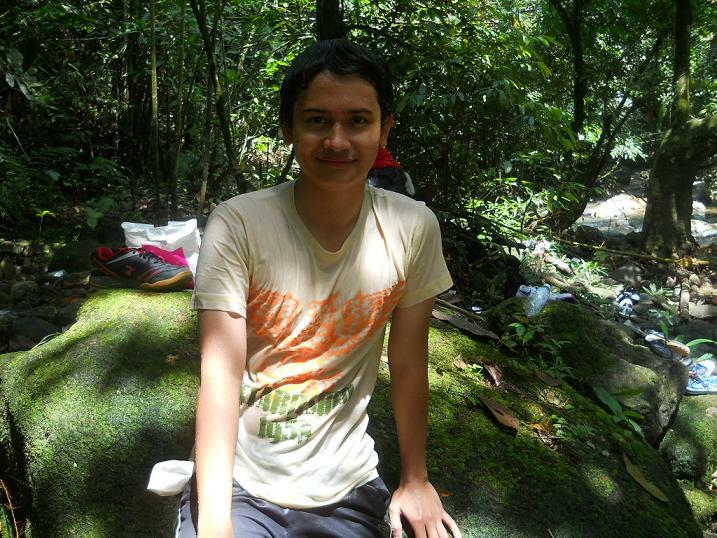 at the midst of October 2011; around 3 weeks ago when I experienced traumatic Tonsillitis!!! As per written in my entry dated 18th October; “Allah’s Omen, A Childlike’s Amen (Part I): Crying As A Beggar (Turbulence In Tonsillitis)”, it was indeed a terrible and melancholic episode. Experiencing the bad Tonsillitis in a stuffy place where dusts and debris were abundant and air ventilation was worst; I was at one of my weakest point in my life ; alone (because I don’t have roommates/housemates). And adding salt to the wound, both electric sockets in the space I lived were not working any more! Seemed like the wiring of the 2 electricity sockets were infused into one and channelled to the main fuse!!! Anyway, after recovered from that and pondered, I had made spontaneous and drastic decision – that was to scout for a new rent house to ensure my health will no more in jeopardizing state! 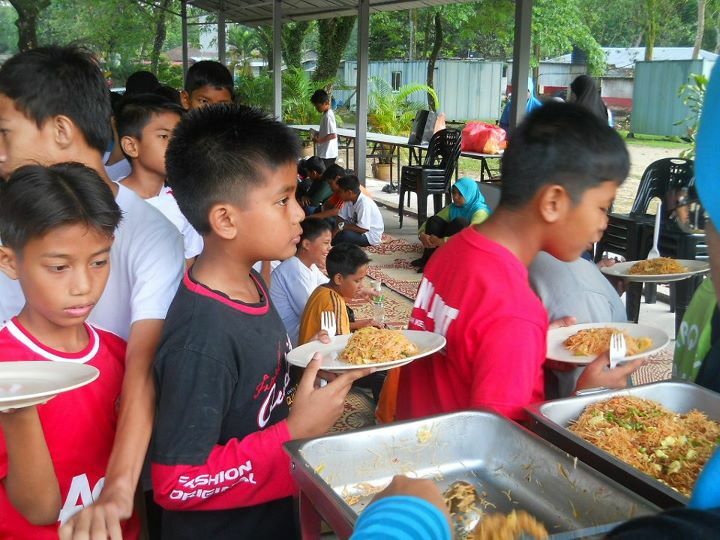 I scouted here and there – with a friend and also asked for the helps from experienced colleague such as Ustazah Rahimah (maestro in Antara Gapi residence). I also asked around and so happened that Kak Rafidah said that there is a house in Desa Anggerik of which owned by her brother-in-law. I decided to meet up with him and perused the place. 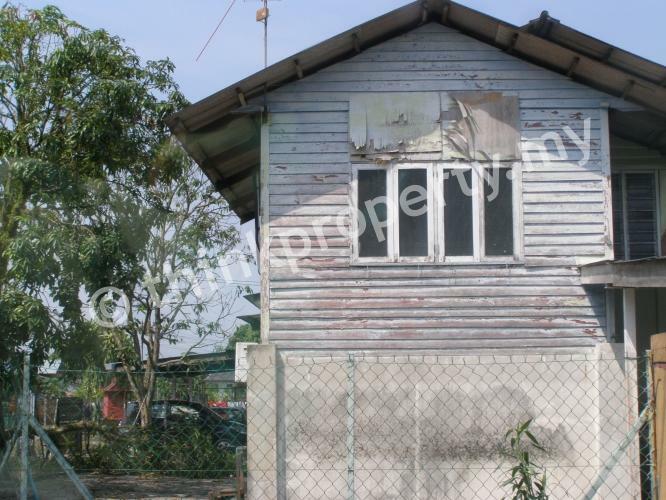 It was indeed FAR MORE COMFORTABLE from the old rent house, with a vast compound, brick-built and what’s more, a ‘surau’ is just around the corner enabling one to hear the Azan. 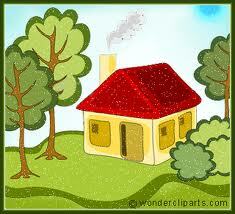 Apart from that, Ustazah Zainab resided the house opposite the rent house and that’s an additional point. Initially, the owner was adamant in putting the price to RM400; but finally with a bit of coaxing, managed to get RM350 but with pricey deposits and some rules (which was said to be concocted due to bad experiences with previous tenants)!!! I won’t divulge the matter as it is delicate but it is worthy although it costed me a great amounts of KACHINGS! But Alhamdulillah, so happened that my parents were around to attend Dania’s wedding in UPM – they were the ones who help me to get everything done and ran smoothly. I was so touched and heart-wrenched whenever I noticed them working so hard to ensure that I would be comfortable. My heart overwhelmed and I cried when I think about it. Probably because knowing that they were there when I was in my weakest point of my life; they didn’t desert me, they embraced me. 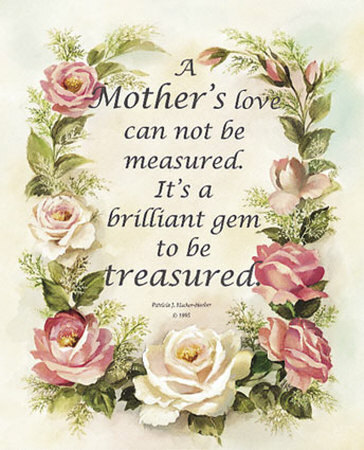 Of course we all realized the theoretical absolute that parents will always be there when we need them; but to FACE THE REALITY crystallizes in front of you, it was just a moment of gratefulness, overwhelmed, heart-wrenching and TOUCHED. I cried and cried and cried knowing that they never deserted me – the only two people in this world I could rely on in this world. I dread the days when they will leave me from this world…. to prepare mentally will be difficult and I have to start. But I am so close with them that I am scare I will be crippled when the day comes. Ya ALLAH…. they never desert me and always wanting the best for their children; they are not rich but they put efforts to make us live comfortable and protect us from harm; I really want to make them happy and repay their kindness….. Mak & Ayah. Allah’s Omen, A Childlike’s Amen (Part II) : Tooth Restoration & Root Canal. 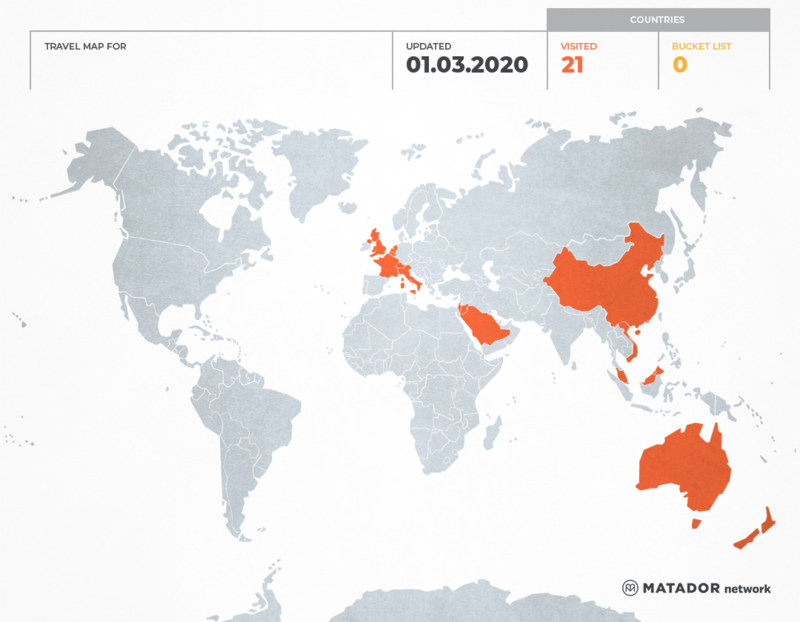 Deaths Of Muammar Gadaffi & Marco Simoncelli. Sometimes tests, setbacks and challenges come upon you – ONE by ONE. As a mere dainty and delicate being, you can’t help but to make fuss about them once a while. I admit that I am fragile and I did slip my way from being stoic. Fresh from my bad Tonsillitis and high fever fiasco, ALLAH SWT has tested me with dental pain – in the midst of period of time where kachings matter the most! Apparently, the weather is so unpredictable. Been raining after I was infected with Tonsillitis but turned back into sweltering scorching heat when I just got better. The effect took a toll to my tooth and I was in indescribable uneasiness and pain! It was so unbearable that I then went to a dental clinic in Rawang on Saturday as the pain started to bothering me in Friday. Arrived in Rawang around 9.30 A.M. but apparently dentist would only arrived around 10.30 A.M. so I decided to have breakfast and read newspaper while enduring the PAIN. Around 10.30 A.M., went to the dental clinic and met the dentist. She said that the old cavity had reopened and from the X-ray she did (twice as the first attempt proved to no avail – even claimed that she would only charge me once! 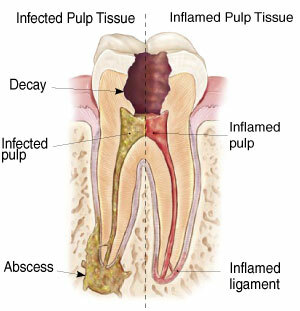 ), seemed like the infection has all spread into the root of the tooth! For the time being, she just did tooth restoration to cover the ‘re-opened’ crack and prescribed antibiotics and prostan as painkiller to alleviate the swollen gum. The procedure took almost an hour! The whole process entailed with RM270! Well, that’s what you got when you go to private dental clinics. A lucrative business for the dental-health practitioner, aite? 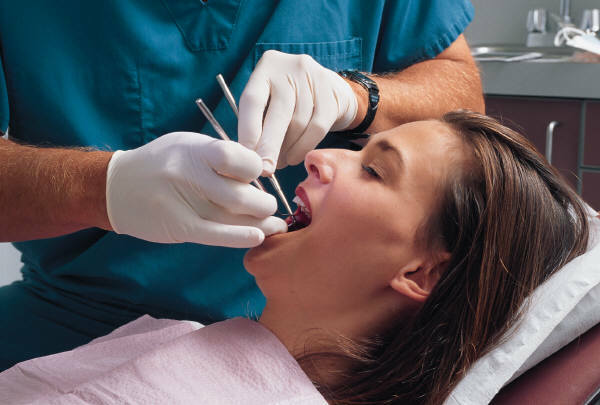 The dentist also told me that she would suggest me to do “Root Canal” treatment to overcome the deeply-rooted infection and the cost is between RM1,000-RM1,500! I was flabbergasted, I have to say! But she said that if I were to do in Government hospital, probably it would be cheaper. So, I totally passed the idea of getting her hands to my teeth! * Additional work – collecting fund from Science teachers for Science Panel’s “Baju Batik” next year*. Kinda tedious to meet teachers one by one collecting money personally. It’s just very tedious. Anyway, amidst the hullabaloos and topsy-turvy, I managed to scout for a new rent house. The journey will be documented in the upcoming entry. With dramas and upheavals. On the recap on global news, the world has been shocked with the death of Muammar Gaddafi, the infamous Libyan leader who has been touted as a dictator by the Western world but as an Islamist fighter by some Moslems. 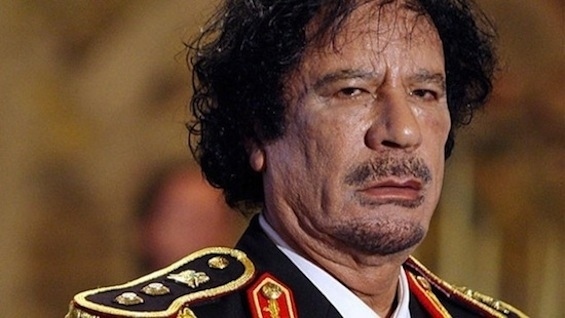 It was reported that Gaddafi was actually caught ALIVE on 20th October 2011 but then died after that due to unknown circumstances! Some said he was beat to death, etc. Personally if you asked me, I felt that he was a dictator although he was a Moslem. His actions painted disgrace to the peaceful essence of Islam – he is one of the typical examples that smeared the sanctity of Islam; and been cited as emblem of Islam as wholly by the Western world. So sad! As the finale part of the setback news, Marco Simoncelli, the Italian motorsport rider was killed in a horrific accident in MotoGP championship in Sepang, Malaysia. 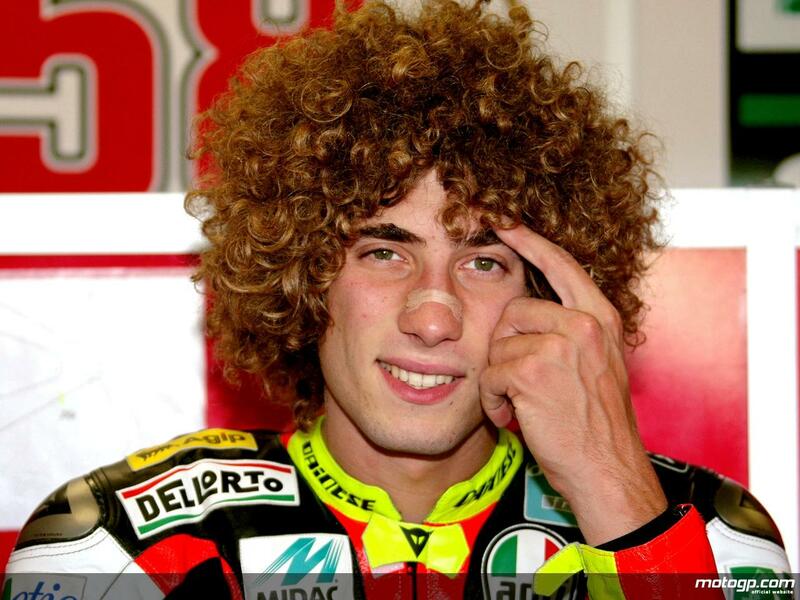 It was said that his path collided with Valentino Rossi and Colin Edwards, thus resulted him to lose his helmet. He was reported to be motionless with severe injuries at the neck, head and chest. 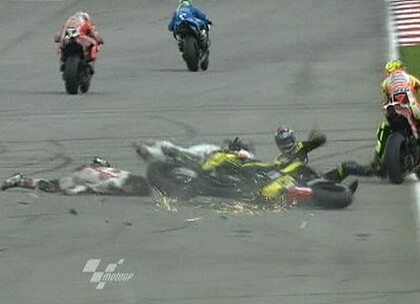 It was indeed a tragic accident as Valentino Rossi was said to be very close to Simoncelli. Nonetheless, what was shocking and sad was the reaction by fellow Malaysian fans who threw rubbishes when the event was cancelled due to the sudden death!! They demanded they had “come from afar and invested”. Well, I am not going to elaborate on that because they have their own reasons, but it does sound a bit sad to know about that, right? On whole, this is a time of test for me. 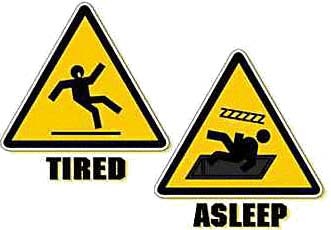 Mentally, physically and spiritually. I pray I will be strong and won’t forlorn. 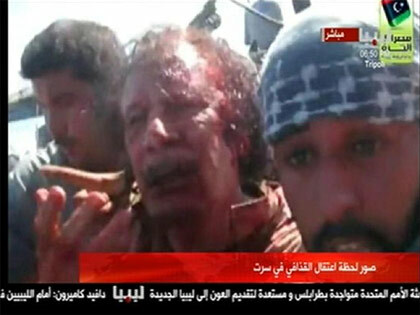 The video reportedly that involved Muammar Gaddafi beat to death. 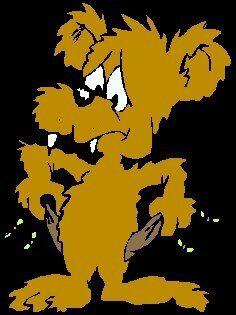 Allah’s Omen, A Childlike’s Amen (Part I) : Crying As A Beggar (Turbulence In Tonsillitis). ALLAH SWT is great. With calamities piling our shoulders, there have got to be a ray of light that comes with it. 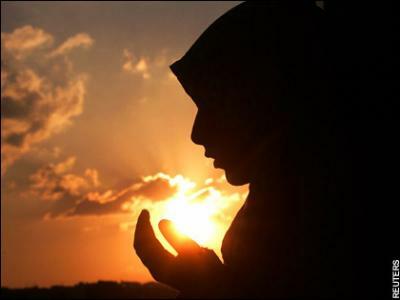 A bless in disguise; an ember in the dark, I say; though I have to say that as a mere dainty and weak mortal soul, you will tend to grumble and make fuss about whatever God SWT has tested you upon with – eventually at the end of the journey, you knew that ALLAH SWT wants to teach you something. Started on Wednesday 12th October, I began to feel uncomfortable and my body grew fatigue and lethargic with sinews/limbs gone tired. 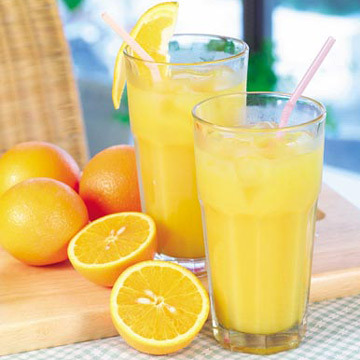 My throat starting to go soar and by 9.30 A.M. in the school, I started to feel dizzy. I’ve asked permission from my GPK1 to go back home because by that time, I started feeling nauseous and my body and headache was hot. 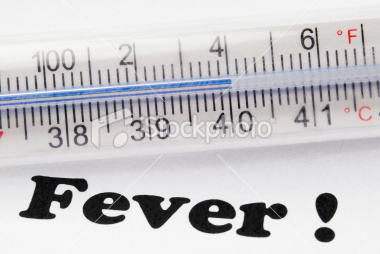 Slowly, I drove to Poliklinik Serendah and was diagnosed by the doctor that the fever recorded 37.5 Celsius!! I was freaking out- went home and took rest but still the heat didn’t last. That night, my body was so hot that I barely could sleep. My head was spinning. For the whole Thursday, I threw-up all the food and water consumed to rejuvenate the body. My stomach jolted and felt gaseous and I had a mild diarrhoea. That night, I had all the Dengue symptoms; fatigue, hot fever and the joints were tired. 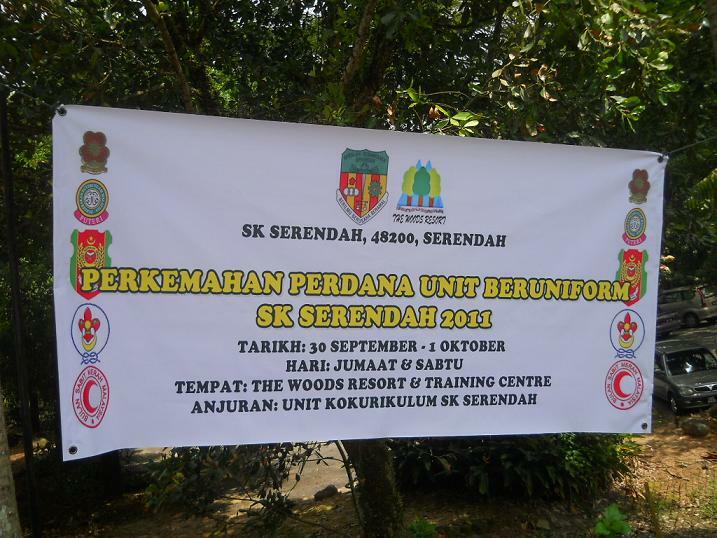 For 8 hours in the silence of Serendah’s night, I threw-up and my stomach churned every now and then. Helpless. Friday morning, gathered strength to go to school to settle all the upcoming Final Examination papers of Year 4 English – the pictures selection, the Head Of English Panel signature, the compiling, etc. 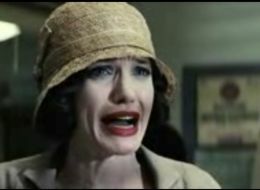 UNFORTUNATELY, merely around 8.30 A.M., my face went pale and the throat was unbearable! Again, my good GPK1, Puan Norazian leniently gave permission for me to go back; and with persistent of beloved colleagues, I went back to get myself a blood test. I planned to do blood test in Putrajaya Hospital because if the verdict ends up positive, then it will be nearer to Kakak if I ever to be warded. From Serendah; arrived at Putrajaya Hospital around 2 hours later – only to find that I didn’t bring my wallet and IC! By hook or by crook, had to shift to plan B which was to do blood test at a privatized institution – Pusat Rawatan Islam Az-Zaharah at Bandar Baru Bangi (because I always went there when I resided in Bandar Baru Bangi and Putrajaya). The crowd was immense and had to queue for the turn approximately an hour before I could meet the doctor. While waiting, my body was shaking madly because I felt it was so cold when actually my body was actually hot. Met the doctor and when he saw my throat, he was shocked to see that my Tonsils grown BIG! AS IN BIG BOIL!!! He recorded the temperature as 38.2 Celsius!!! Oh My God! I felt like fainting – no wonder that my body was shaken on the outside for being cold because in the inside, it was feverish HOT! The nurses gave me a blanket to cover my body while they took my blood for test as I was SHIVERING and SHAKEN. 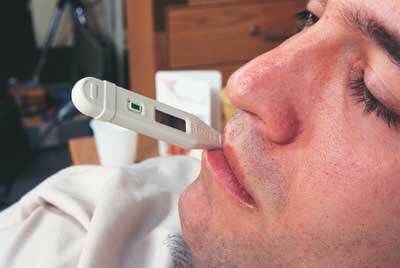 The verdict came out and turned out that my blood was polluted with bacteria – perhaps due to the tonsils. Nevertheless Alhamdulillah, no sign of Dengue precursors found! 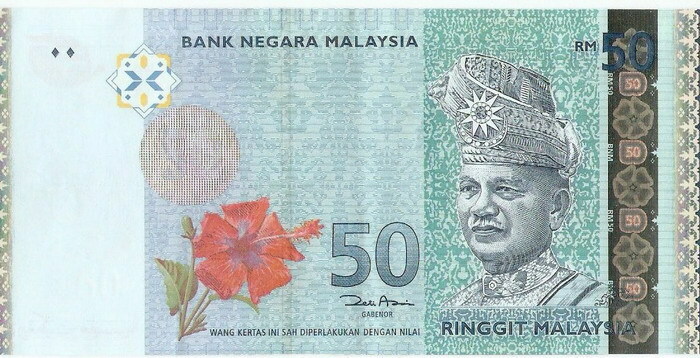 When I went to the counter, the fee was RM107. Guess what? A good friend of mine who brought me from Serendah to Putrajaya (Bless his soul although he refused to be named! – but he had to go back to office once dropped me by to Az-Zaharah) just lent me around RM100 (since I left my wallet in Serendah)!!!! That means I still lack RM7! – I was waiting for my sister. 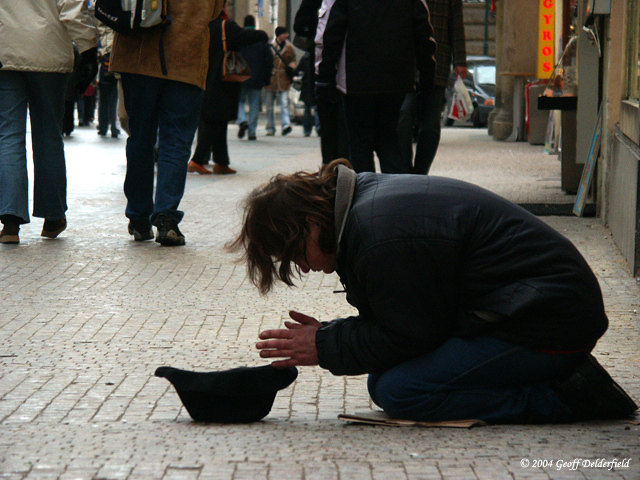 When she finally arrived, I couldn’t control my tears that I cried unabashedly because I felt like a beggar. Honestly when now I am getting better, it doesn’t sound so register in the mind but when I was in that situation, I was so down, feeling mistreated and outcast. I cried thinking about the fate of myself and thinking about Mak – who definitely takes good care if she was there. It was really a heart-wrenching moment of my life. Kakak bought me luncheon and she had to go back to office to settle her work. So I just rested my heavy and hot body. The first night wasn’t bed of roses because my body was still adjusting to the changing. Drinking 100 plus and all the pills sometimes make me wanted to throw up. On Saturday, I just slept the whole day and ate bread and bits of rice.Had to do it myself although I had to slowly forced myself to go out from the bed and the room searching for the food with my meagre condition. On Sunday, I gathered my strength to go back to Serendah with the help of that good friend of mine since Abang Zam said he was busy and Kakak mostly can’t drive all the way to Rawang. 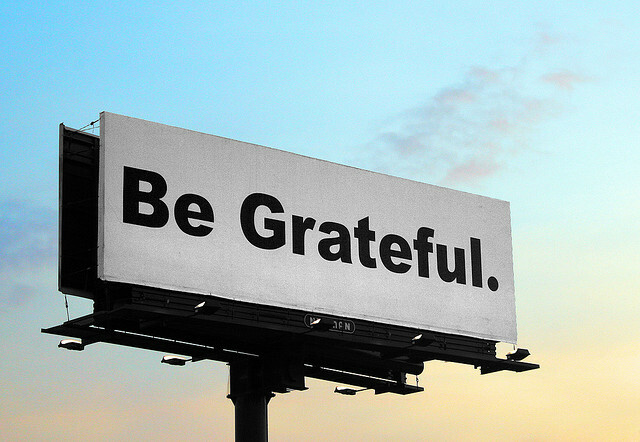 Thank God, Alhamdulillah for that friend (who refused to be acknowledged or name mentioned – but I still need to do that because am so grateful and thanked!). 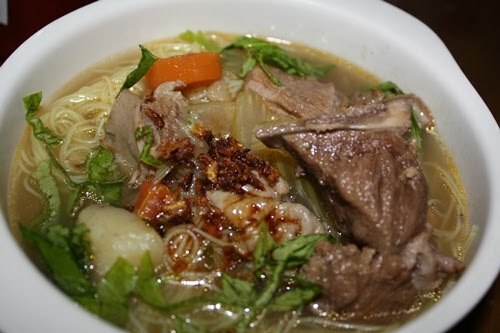 Although still felt a little bit peaky and frail, but Alhamdulillah the condition got better as my menu consists of ‘Bee Hoon Sup’, chicken soup and also lukewarm fresh orange juice. On Monday, I resumed my work back to school. Although initially began the day quite weak; I ended up getting better. Colleagues were curious and bombarded me with questions. And some of them were patient enough to become shoulders for me to cry on when I related my sad, frustrating episodes to them. Supposedly, I had to go to Melaka for this Ministry-organized course on ICTL (teaching ICT in English; a part in English syllabus) but due to my setback, I had to reject the 5 days course. Luckily my GPK, Puan Norazian is rationale and put things to sense by rearranging the arrangement for who’s-who-for-the-course. Thanks Kak Yan; so much! Really appreciate immensely. On whole, this whole experience has taught me a lot more about life. It is true. ALLAH SWT is great. You may think you’ve seen what world has to offer; but there are more unfathomable colours coming right at you! I’ve also learned that people may say that blood is thicker than water; but maybe it is better because of that, water seeps in the skin and right into the heart – whereas blood coagulates so thick that when it is wrongly mutating, it will lead to thrombophilia – clotting your blood vessel, suffocating you to death. 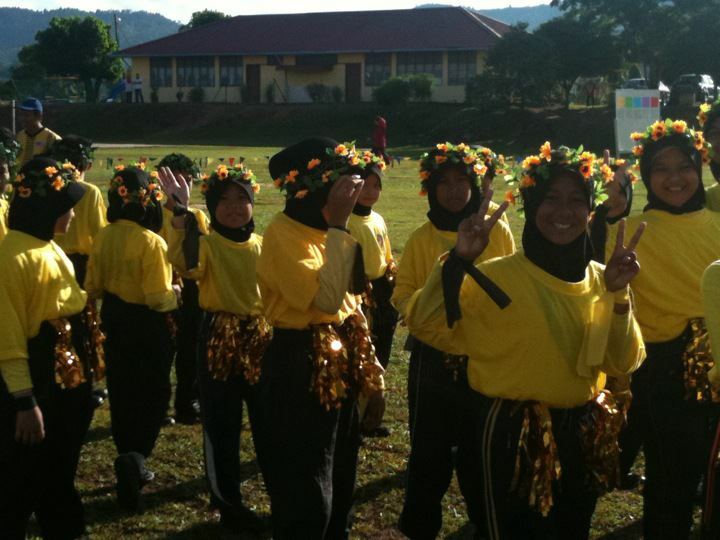 Topsy-Turvy Teacher (Part II) : National Financial Budget 2012 a.k.a “Belanjawan 2012” & SK Serendah’s Sports Day 2011 (Emceeing Africa & Lambada)! 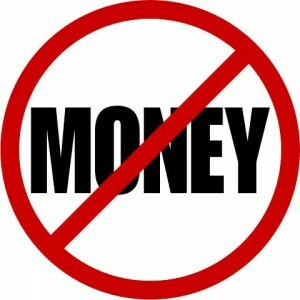 Recently, Malaysian Government has announced its National Financial Budget for the year 2012 (“Belanjawan 2012). 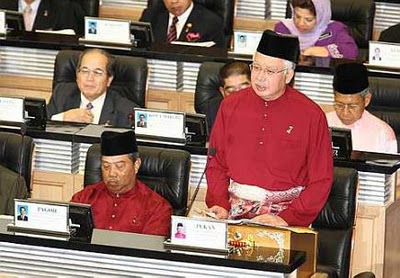 As expected, the plan ignites uproars and mixed reactions from every Malaysians – on the basis of his/her own political inclinations or economical favouritism. Whatever it is; as a plain, greenhorn teacher who is responsible to educate the young buds of Malaysian future generations, I thanked the Government for prioritizing the Education Line these days and acknowledge the importance of teachers in educating the youngsters as main catalysts for our nation’s development. Indeed, now is a high time for Education Line in Malaysia; and to jump into the field when Government is putting high priority – is something that I feel blessed and grateful. RM50.2 billion is allocated to Ministry Of Education and teachers of DG41 scheme will be elevated to DG44 within the span of 8 years as opposed to the current time-based which applies as 10 years. And of course besides that, the half-month bonus for all Government Civilians by the end of the year. Besides that, the paycheck scheme for Government civilians are also to be revised – which happens to be something that is anticipated (,”). Anyway, just feeling blessed and grateful. Thanks, Malaysia! 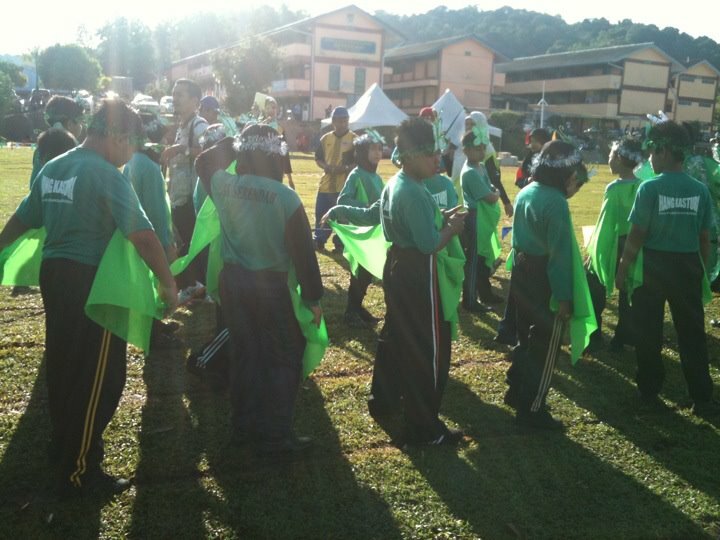 Cikgu Zuraini & I emceeing the Sports Day – Courtesy of Cikgu Khairul Muzammir. 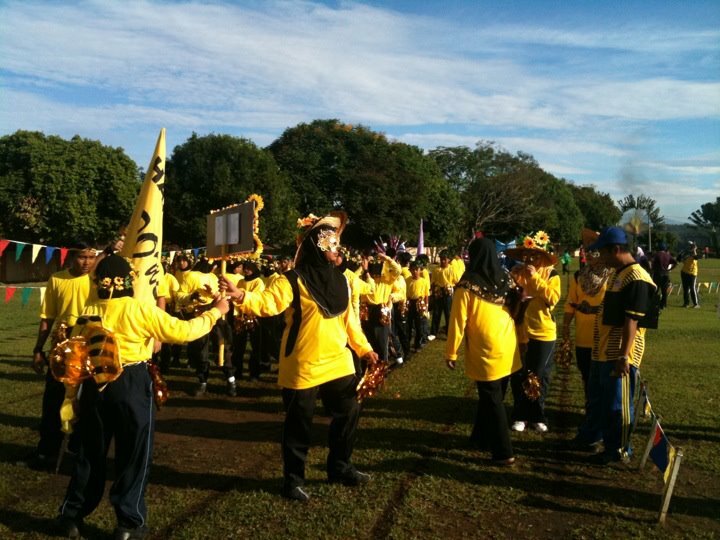 The backbones of Yellow House 2011 – credit to Cikgu Rosmainy. 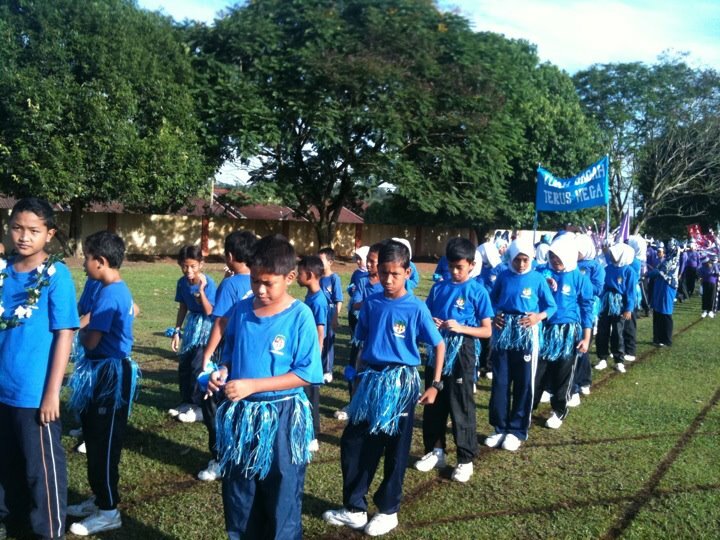 Anyway, right after the hectic Additional Sports and Boot Camp days, the school was so busy with its Sports Day rehearsal spanning from 3rd October until 7th October. For Monday and Tuesday, each house is to rehearse its own team in athletic games; On Wednesday, Thursday & Friday, the preparations for house decorations as well as performance during the marching. The time was limited but the urge to execute a lot of things was immense! 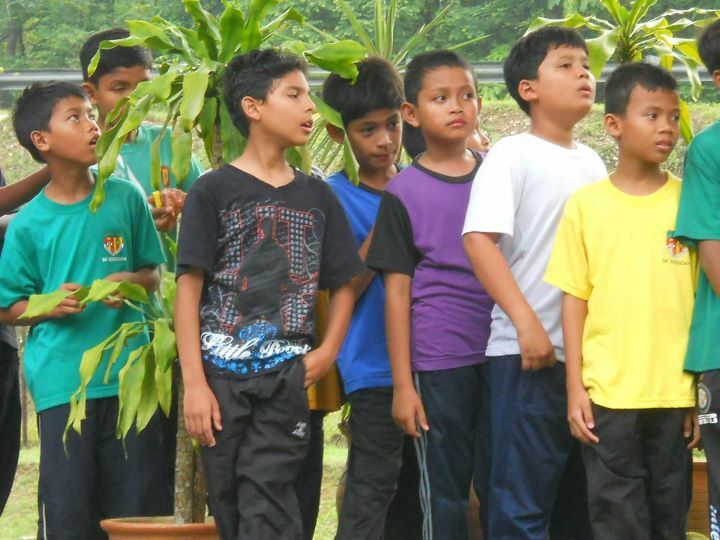 I have to confess that I was really busy for the whole week – I was entrusted to be the officers in Sports Day rehearsal; and then to train the kids of Yellow House for the performance single-handedly! 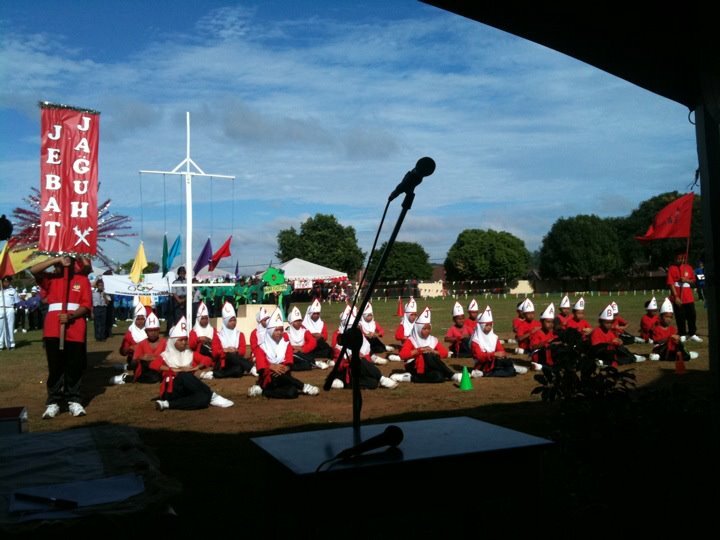 On top of that, I was entrusted as the Emcee (MC) for Sports Day – so it was indeed back-and-fro moment! The Yellow House (Hang Lekir) preparing to march. Costumes ala African fantasy/colours – Courtesy of Teacher Miss Nor Azlin. It was a bit skull-cracking to coach 33 pupils single-handedly within the span period of 4 days. At last, I chose “African Dance” with fusion of tracks from “Circle Of Life” (OST ‘The Lion King’)-“Waka Waka” (Shakira)-“I Like To Move It” (OST Madagascar). It was pretty daunting to manoeuvre the choreography alone and to have the kids being timid and not giving full-heartedly was sometimes a disappointment. But, I took that as a challenge – I mean, if I were to give in, who else would Yellow House depended on, right? Do the best till the last breath! The kids seemed to enjoy that and the other teachers were helping too in siphoning opinions and doing decorations for the kids. 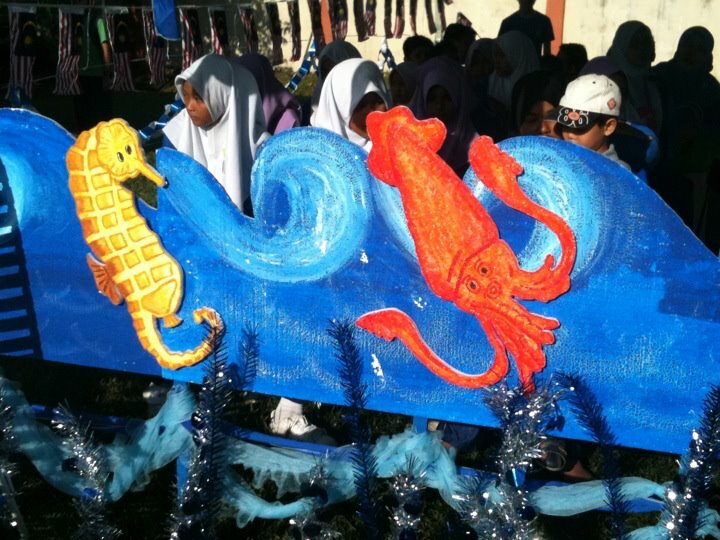 I guess we all did our job – I did the creative side whereas others did the facades and decorations. Each and every one of us do own departments and specialties. And Kak Sakinah, the leader of the house also showed immense support and commitment; so the spirit was channelled. The Purple House (Hang Lekiu). 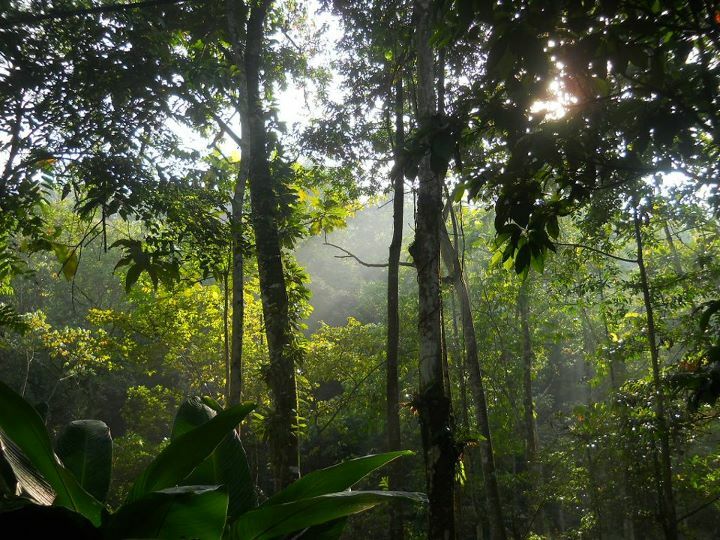 The Green House (Hang Kasturi) with Flora & Fauna was preparing to march. 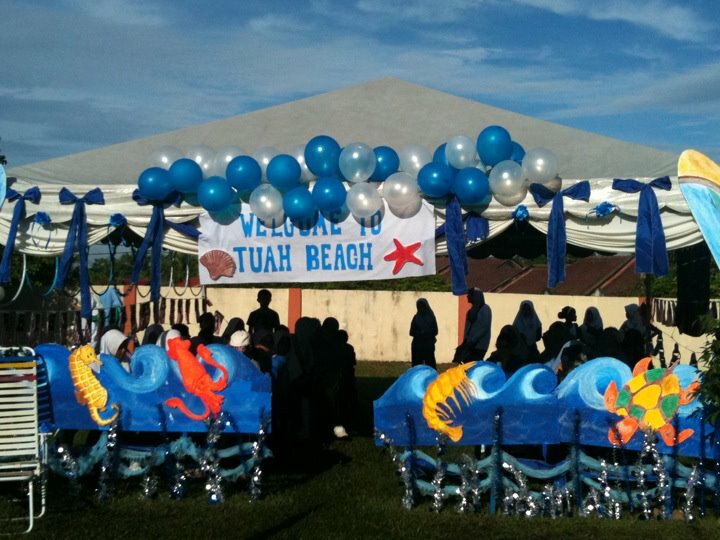 On 9th October, Sunday; the school organized its Sports Day. 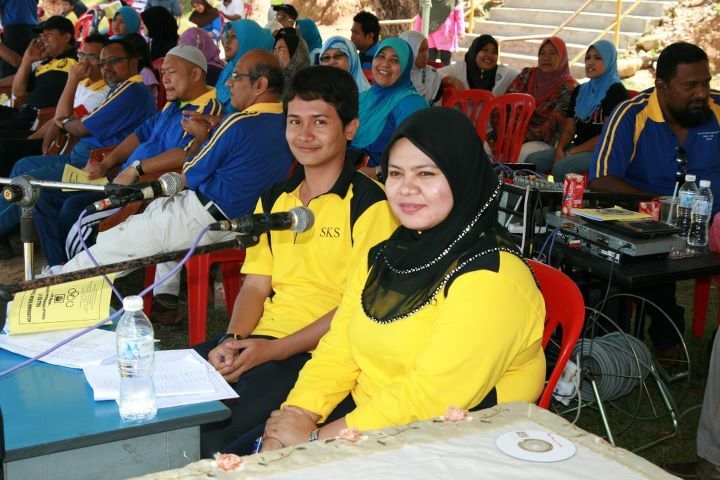 My partner for emceeing was Cikgu Zuraini. 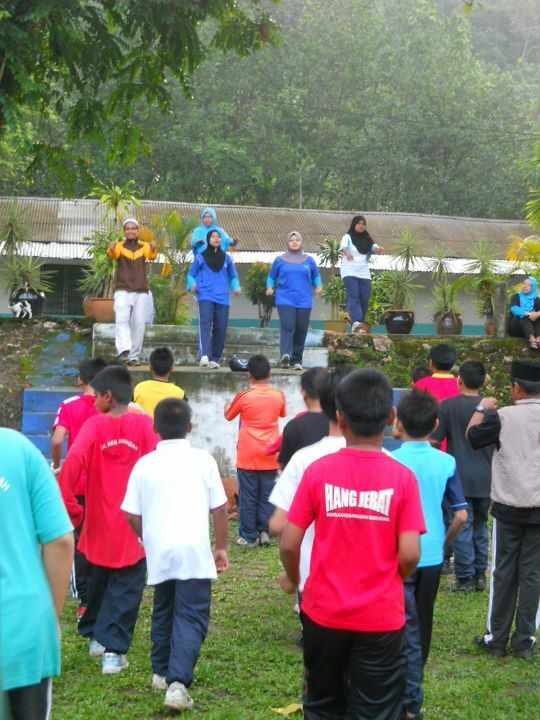 Alhamdulillah, everything went well and the crowd was quite pleased with the way I conducted the emceeing task- by injecting euphoria and energetic spirit ala sports commentator whilst pupils were doing their athletic games (sprint, relay,etc). I was satisfied that Headmaster, YDP PIBG and Kak Sarah, our Guru Cemerlang were pleased with the way I emceed the Sports Day and to be lavished with congratulatory acknowledgement by these people were already great relieves for me! Red House (Hang Jebat) performing “Silat” – similarity is so uncanny to the performances concocted by Kak Lin and I for Green House last year. Hehehee.. 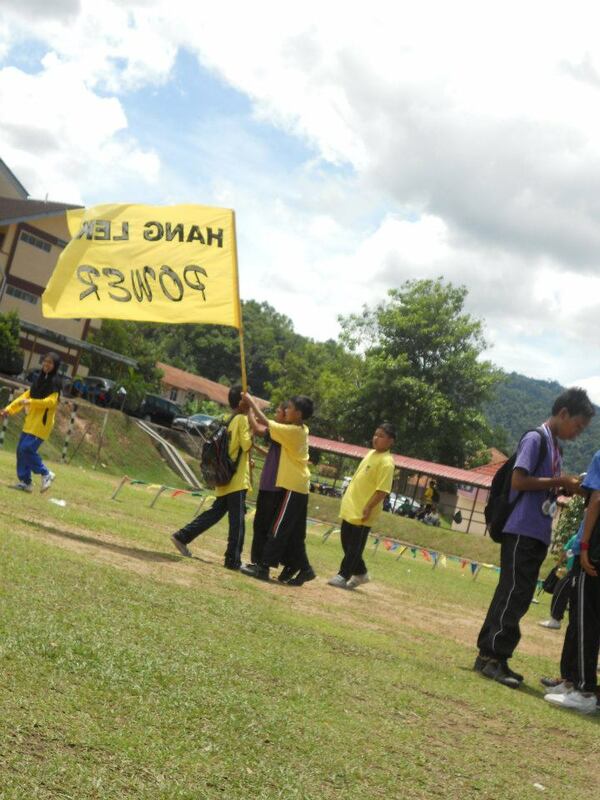 Unfortunately, Yellow House was the No.1 group to march and to perform. So happened that the music CD was not played aptly by the PA system man!!!!! I ain’t going to say much about it because it would be disgraceful but yeah, I was kinda disappointed with the inefficiency and to add salt to the wound; people don’t usually give a damn about team who performed first because audiences were still dilly-dallying. The kids? The girls were great and danced their hearts out; but the boys were practically stupefied and mortified!!! I had the feeling they purposely frozen-up their dance – so that their machismos did not falter. *Sigh* Perhaps, they were ashamed that friends would make fun of their ‘graceful’ moves! BUT, that wasn’t the case for the clear winner of the performances by Blue House – choreographed by impeccable Kak Lin & Kak Aireen! Hahahhaa, when you combined them two, the forces were just unbearably awesome! 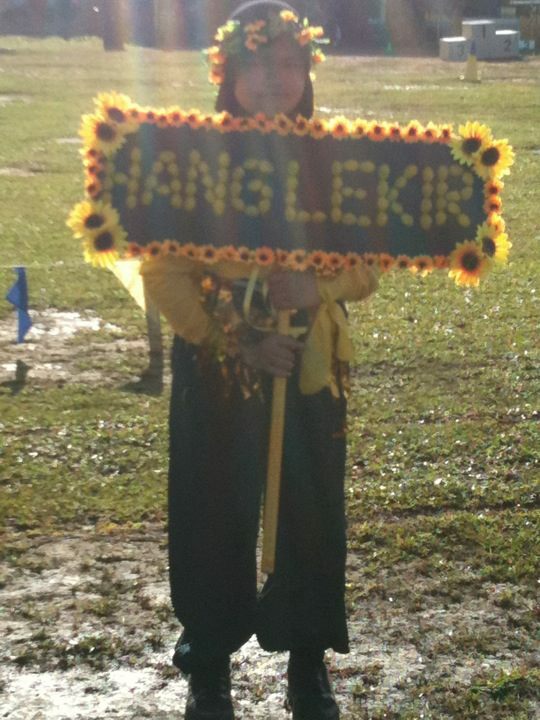 Last year, I joined force with Kak Lin (which unexpectedly won for Green House; Hahahahaha!). The moves were slick and apt; the movements were graceful and the kids? THEY WERE VERY SPORTING AND GAVE THEIR ALL! With the Hawaiian theme and ‘Lambada’; you just can’t resist the euphoria! There was definitely no contest – clearly the winner! 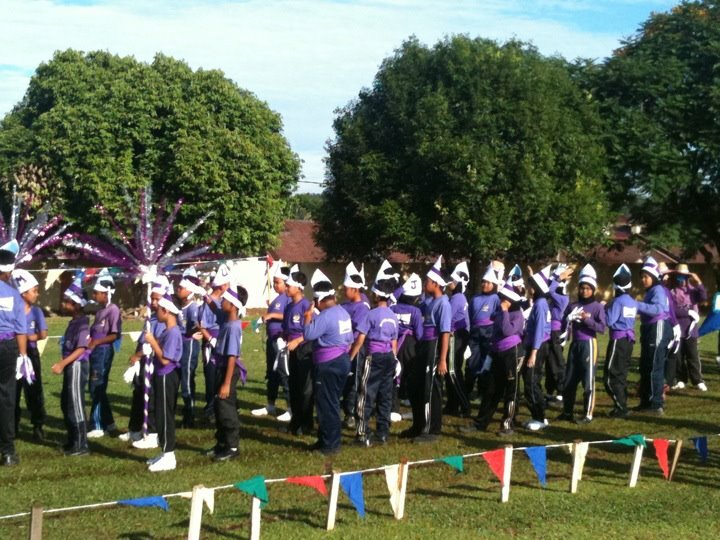 The Purple and Red Houses dwell in traditional ‘silat’ – a similar performance done by Green House last year (Kak Lin and I) whereas Green House (this year) did Flora-and-Fauna theme. Unfortunately, technical problem marred the latter’s performances. It was kinda sad because when you trained so hard, some itsy bitsy trivial matter jeopardize your best, aite? 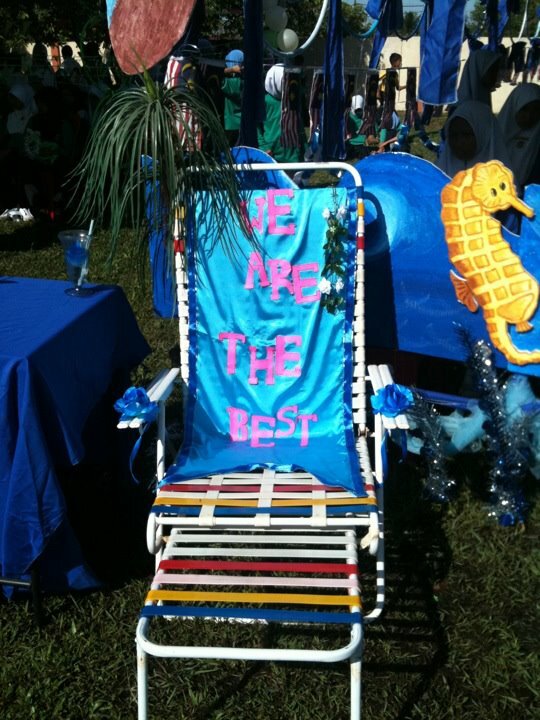 Nevertheless, the teachers who choreographed the performances and decorating the camp-houses should be praised and complimented for their creativities within limited time!! It’s not easy! BUT, within short stint of time; all of us managed to come up with creative performances! Amazing, isn’t it? Hang Lekir ‘POWER’ (I don’t know when the tagline comes about. Hehehe) – credit to Atikah Rafee. 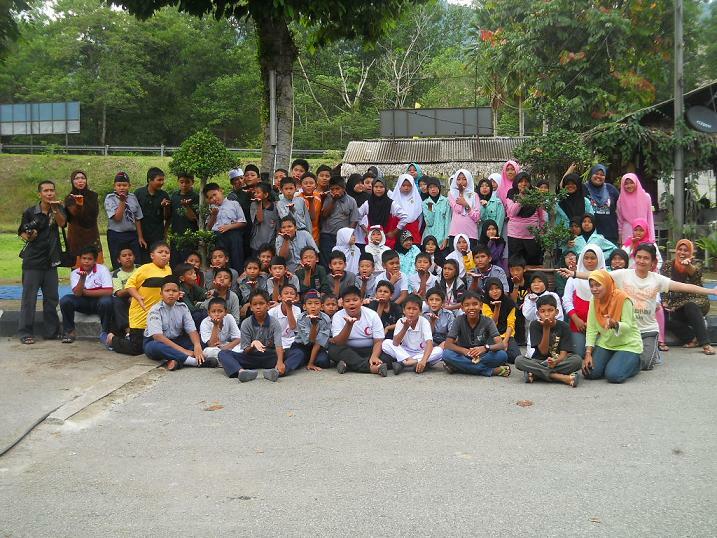 ** P/S : All pictures credits to Teacher Miss Nor Azlin; and 3 pictures respectively to Cikgu Rosmainy, Cikgu Khairul Muzammir & Atikah Rafee. I didn’t have time to snap pictures since I was so occupied with emceeing. Hehehehe. Enjoy the video of our winner. The performance is AMAZING! (,”). We teachers do wonders, don’t you think? Topsy-Turvy Teacher (Part I) : SK Serendah Additional Sports & Annual Boot Camp 2011 @ The Woods Resort, Ulu Yam. All I can say is that my post-Aussie days are really hectic! 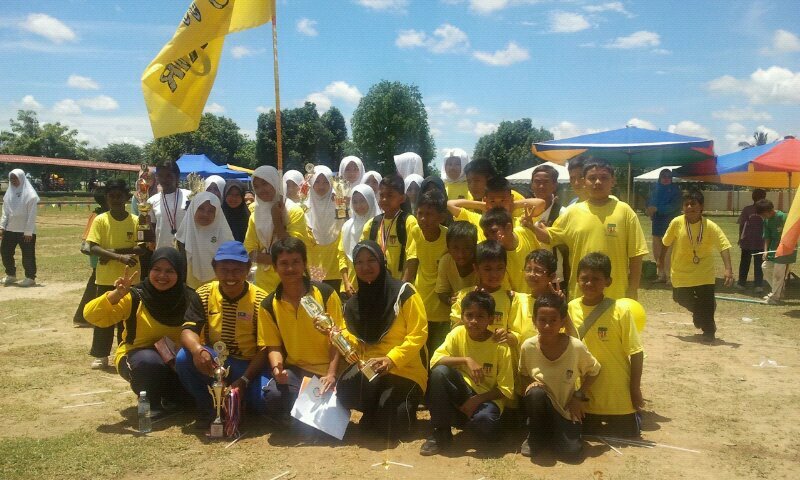 The week started on 26th September 2011; the school organized Additional Sports spanning from Monday till Friday – and I’ve been entrusted to be the officer of Shot Put (‘Lontar Peluru’) together with Ustaz Shuib and also for sprints and relay along with other colleagues. With the unpredictable sweltering-and-suddenly-raining weather, it was undeniably exhausting yet one has to execute the tasks entrusted, eh? On the weekend 30th September & 1st October 2011 (Friday and Saturday), a few selected colleagues and I went to The Woods Resort with the kids for Annual Boot Camp. I have to admit that it was REALLY TIRING to be on duty on the field for the past 5 days and then without rest, whisked to the Boot Camp since I was one of the facilitators. But, it was all worthy! Seeing the excited faces of the kids when they learned that I would be joining them and as well as having great colleagues who joined us, the activities were fun lot! 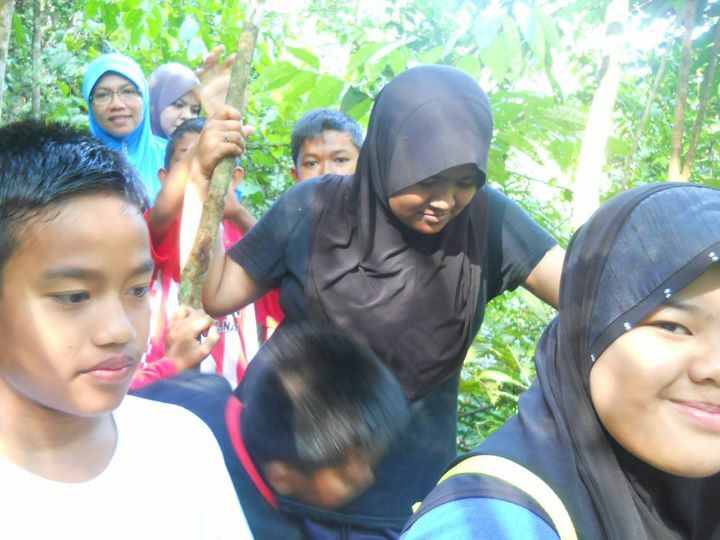 The first activity was Flying Fox. 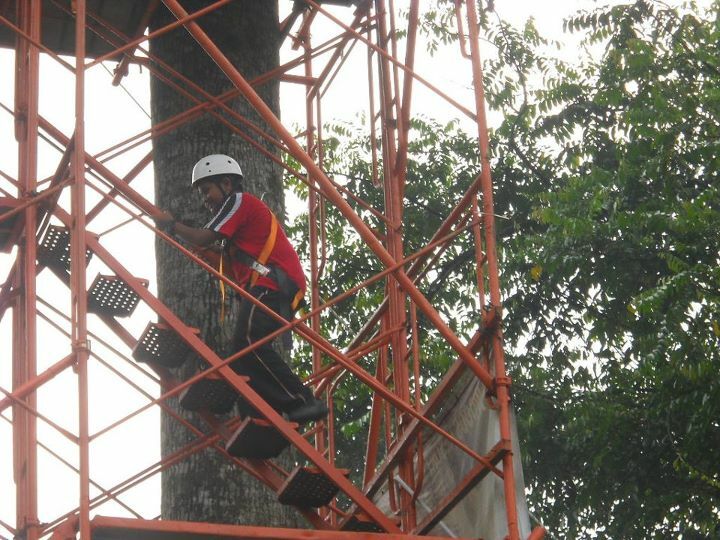 At first, Kak Aireen and I planned to went up but due to some ‘spontaneous drama’ (hehehe), I went up alone. Kinda scared at first because the iron stair was SO TALL but of course I’ve to put brave facade as my pupils were watching me! Had to set some example, aite? 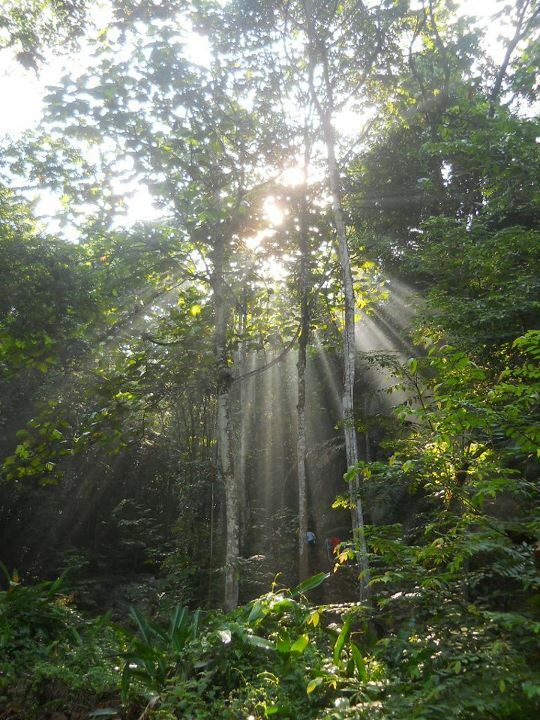 It was an ethereal feeling whisked from above to below via flying fox! Yeeha! On that night, we went for Nightwalking. 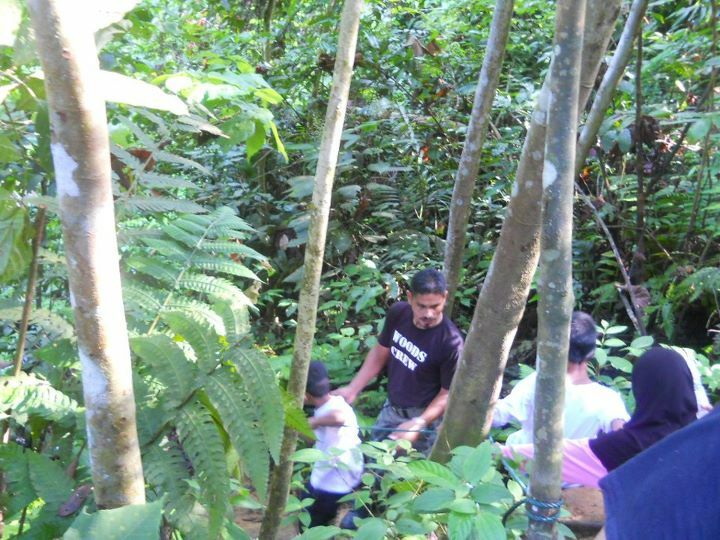 The crew of The Woods Resorts supervised us and facilitated us into the jungle. The kids were excited and of course a great experience for them. Tranquil for the mind especially when you listened to the waterfall gushing on the rocks in the silence of the darkness. But with 80 kids – it’s IMPOSSIBLE to have a quiet scene! Around 10 P.M., we all gathered in the hall and had Karaoke session. Hahahhaa, like usual the teachers crooned – thanks to GPK Kokurikulum for understanding how much we needed sense of entertainment after enslaving ourselves! Hahahha, I didn’t miss the chance and utilized the karaoke as much as I could, too! 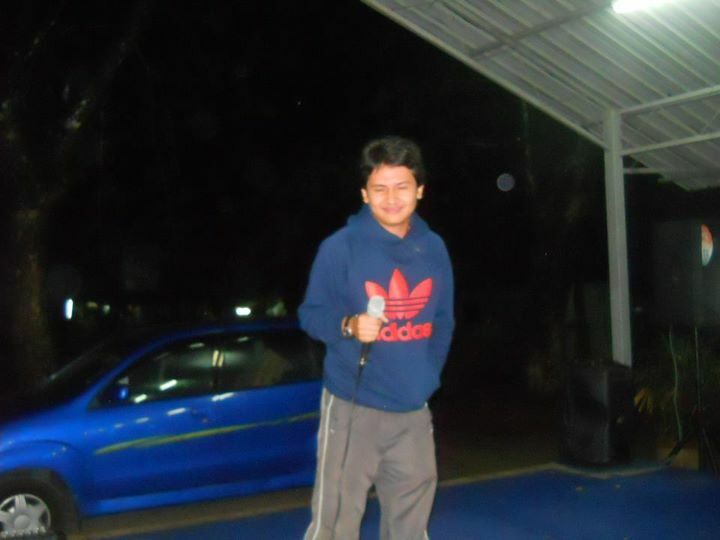 “Sonata Musim Salju” (Hazami); “Tiada Lagi” (Amy Search) ………….till 1 A.M. Hehehehe (,”)! The next day as early as 5 A.M., the boys were all woken up. 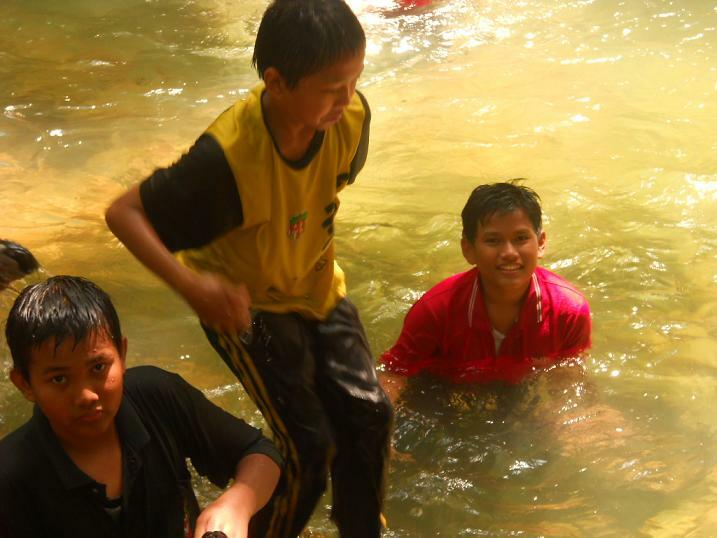 Since Ustaz Tarmizi (Camp Commander) had to go back as he had some J-QAF courses and Cikgu Rosmainy went back, too; so only Cikgu Khairul Muzammir, Cikgu Fridaus and I were left to take care of the boys. 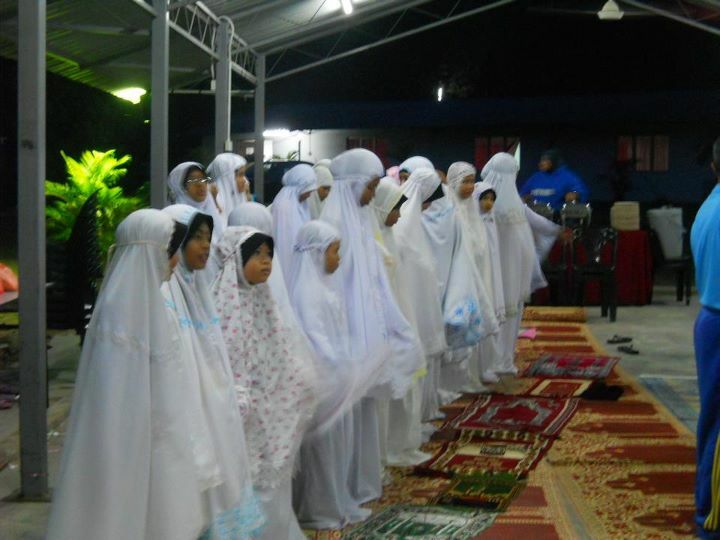 With Cikgu Fridaus as the Imam, we performed Subuh prayer at the hall (Cikgu Khairul had to go back due to personal commitment) – the girls were late and penalized during Aerobic session. 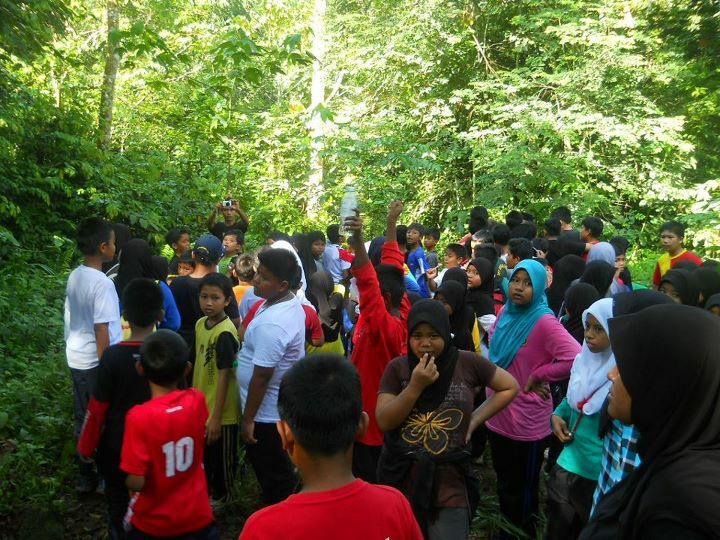 After Aerobic and breakfast, the kids prepared to enter the woods for Jungle-Trekking. It was amazing! 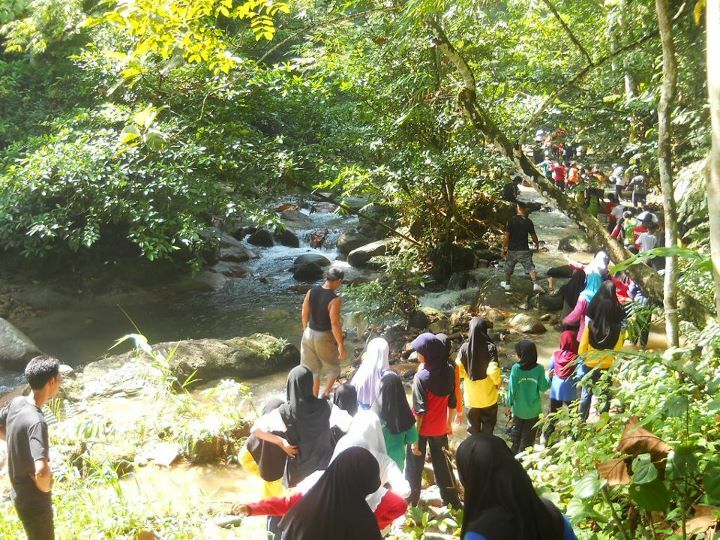 Although tiring but we had so much fun and experience savouring the lush greeneries of Malaysian Tropical Jungle and Nature. 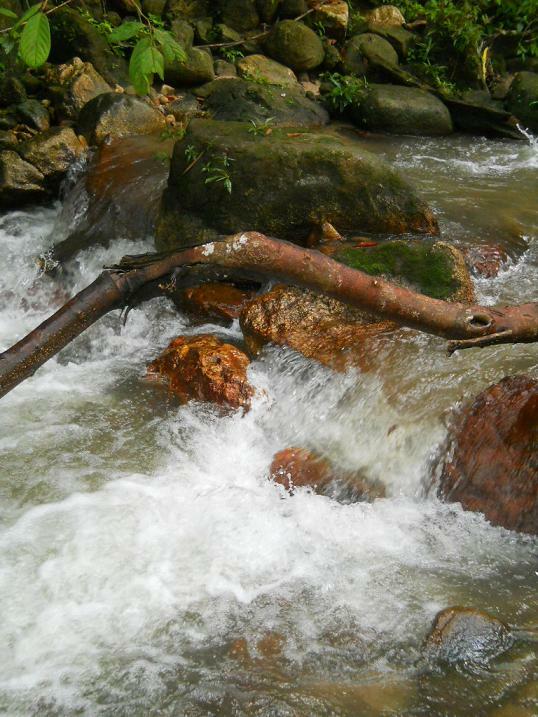 Afert that, we went to River Trailing where we walked against the river current. It was AMAZING! Although the rocks were slippery and wet and I’ve to say I fell few times and my knee knocked the rocks because I brought along my camera for snapshots, it was all worthy! And the icing of the cake was the waterfall! 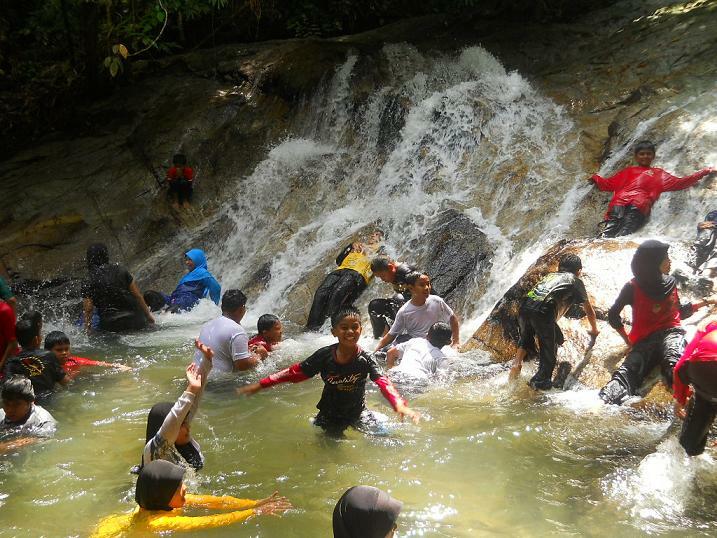 We all were so excited that we all swam and savouring the cold waterfall! Subhanallah! 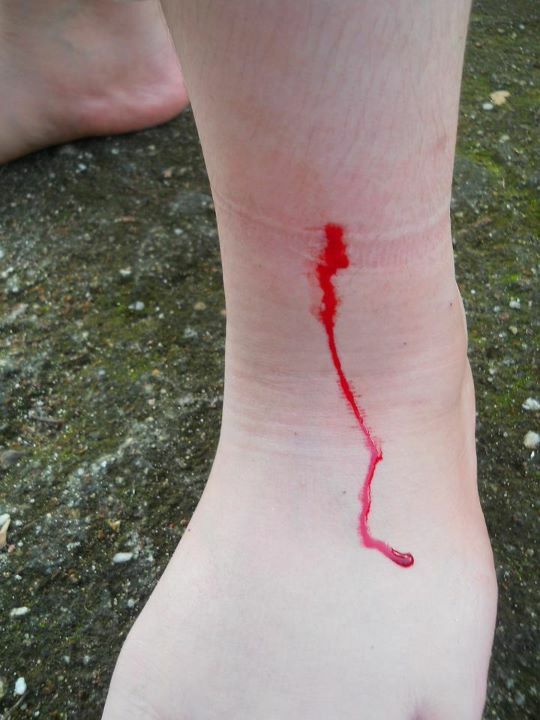 Naem’s leg punctured by leech! We arrived at the camp around 12.20 P.M. Had luncheon and the kids boarded the buses back to school while I drove back home. All in all, it was a great experience with the kids and my colleagues!